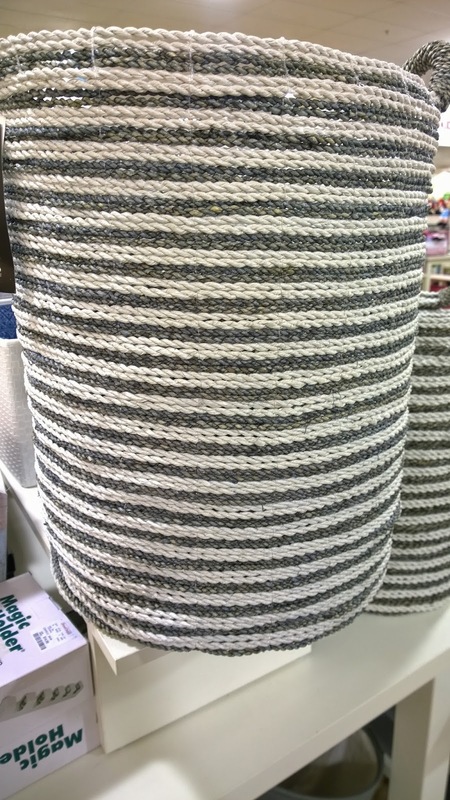 On a recent trip to Home Goods looking for some inspiration for my throw pillows, I realized I haven't taken any photos in a long time of things I like. So come along and we'll "window shop" together. 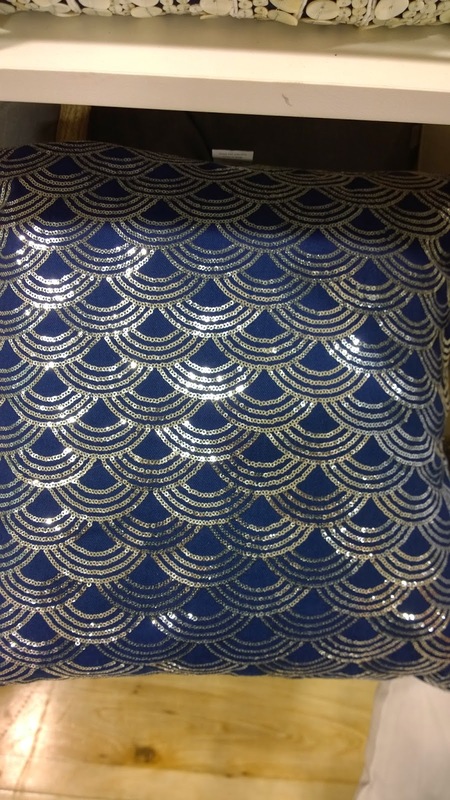 A cute Navy blue throw pillow with a silver all-over scallop pattern. 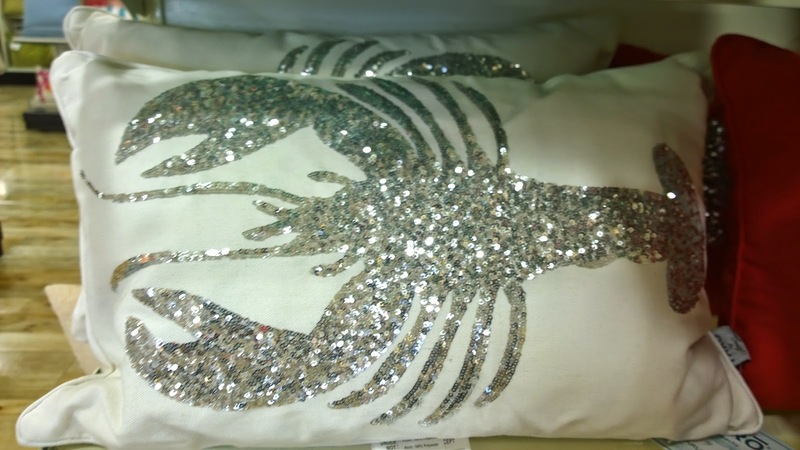 These white rectangular pillows are adorable for summer time with their sparkly glitter lobster and crab design. 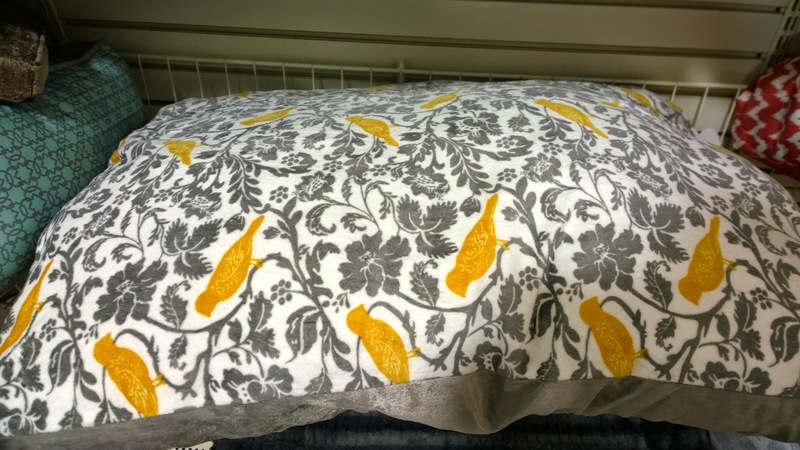 While perusing the pet aisle I found this adorable doggy bed in a gray floral pattern with mustard colored birds. 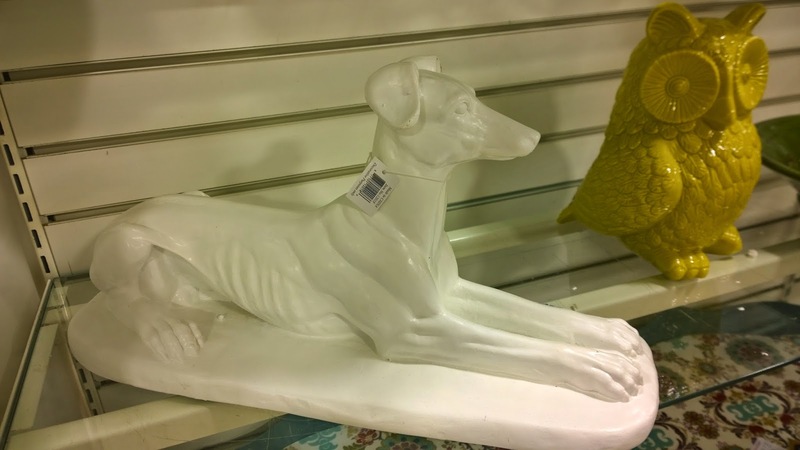 It would look great in our bedroom when we get a puppy! And here is the dog bowls I would get. 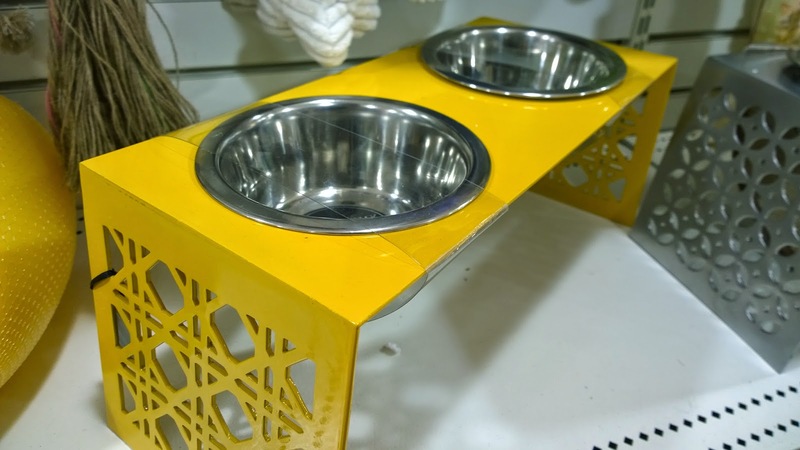 I think the above ground design is good for dogs while eating and I love the yellow color with the pattern on the side. 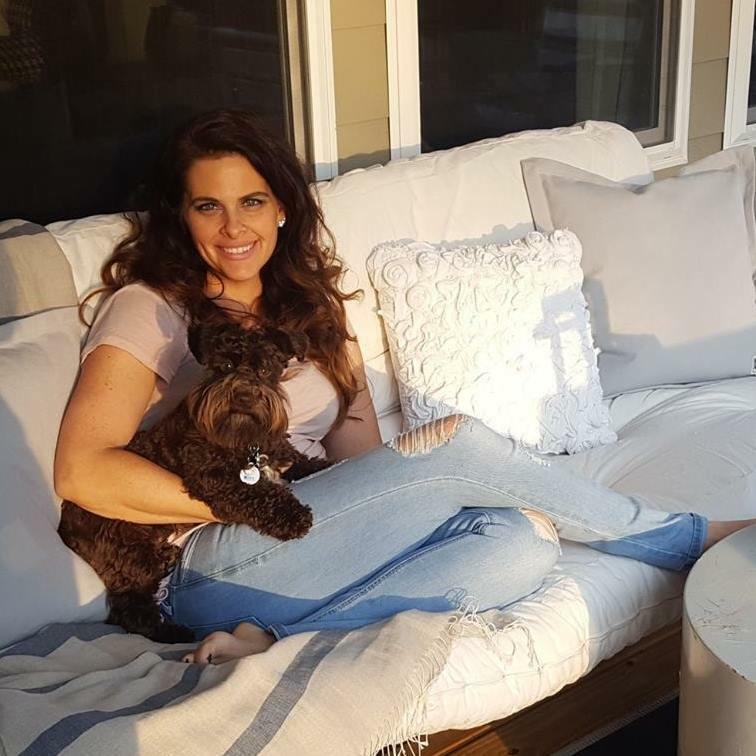 What dog wouldn't love these? This was cute. 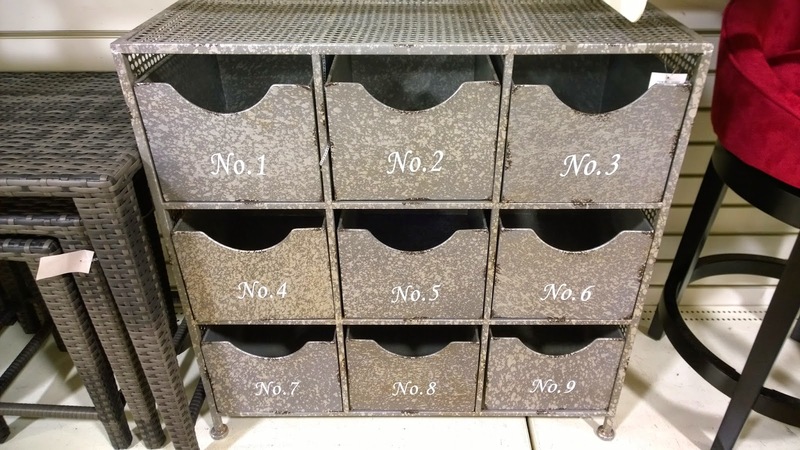 It's a 3 x 3 metal shelf with metal storage bins each labeled with numbers. 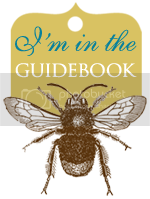 I can see this being useful in a mud room for shoes or maybe for storage crafts. 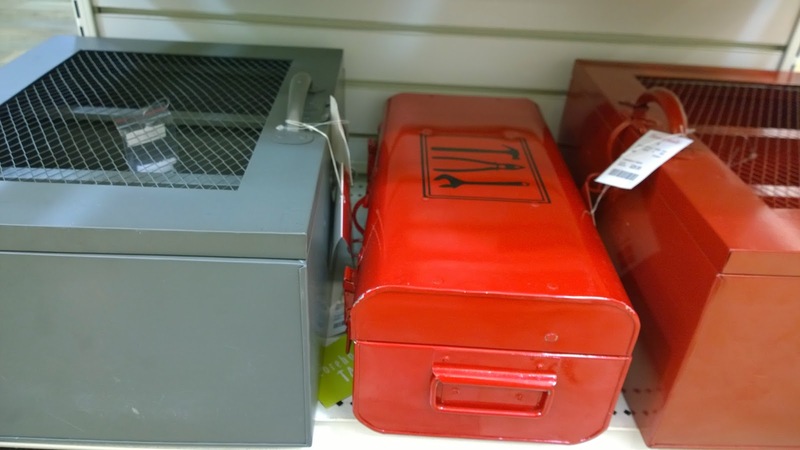 These metal storage bins were so cute in gray and red. They remind me of my Dad's old tool boxes growing up. This blue and gold box was curious. 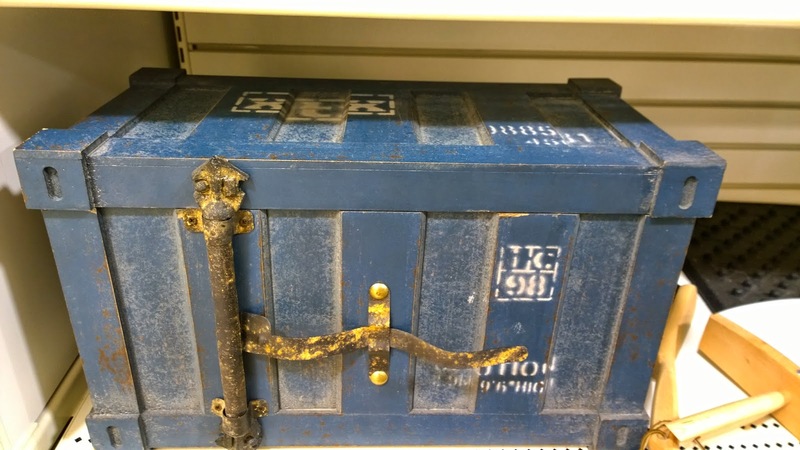 It reminded me of a treasure box and would look very cute in a boy's room for their treasures. In the clearance aisle I even found some cute items. 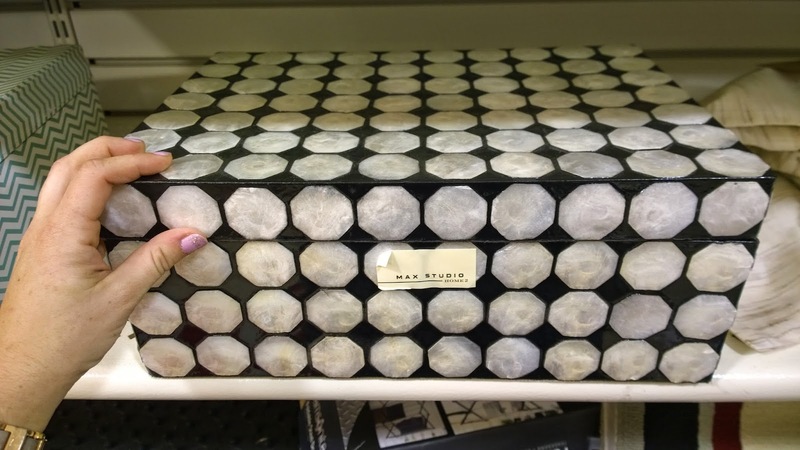 This black and white capiz storage box was so pretty. 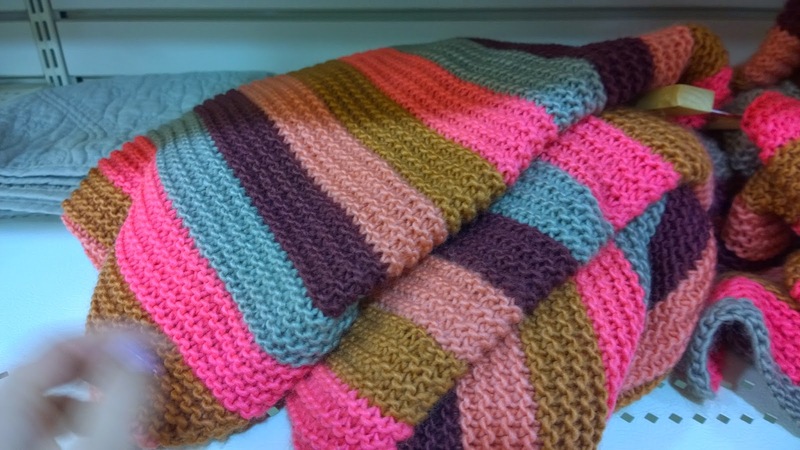 And this brown, pink, purple and blue throw blanket was on clearance and would make a cute color statement on a gray sofa. 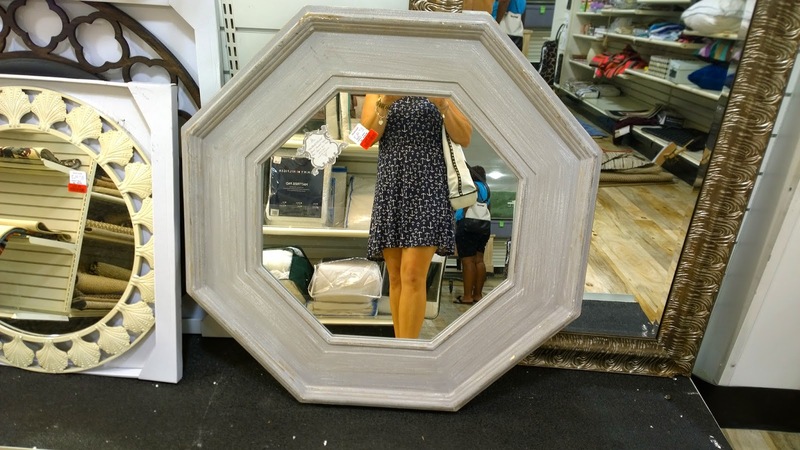 This octagonal gray mirror reminds me of the mirror we have over our mantel but with a chunkier frame. 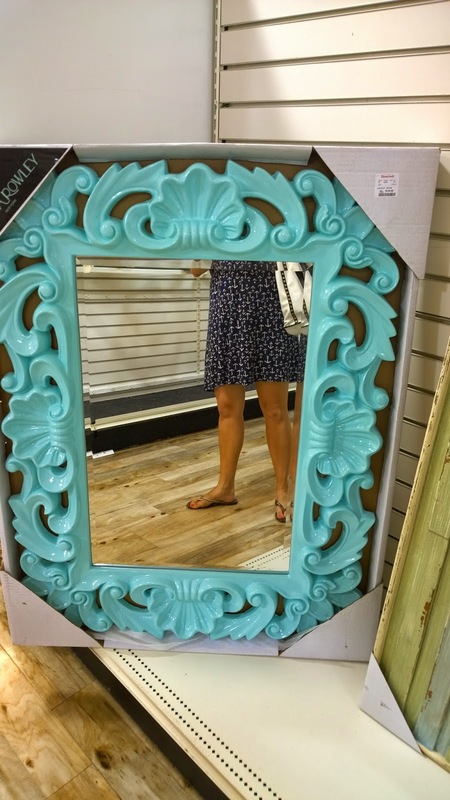 I adored this light turquoise mirror. 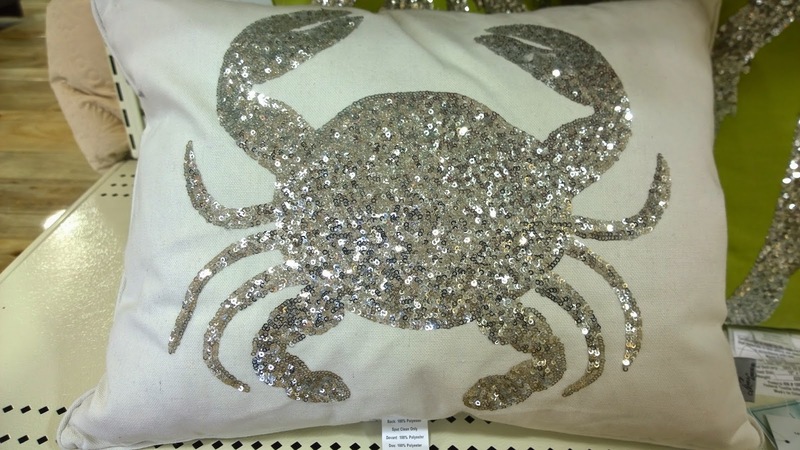 It was considerably large and would look pretty in a bedroom or little girl's room. 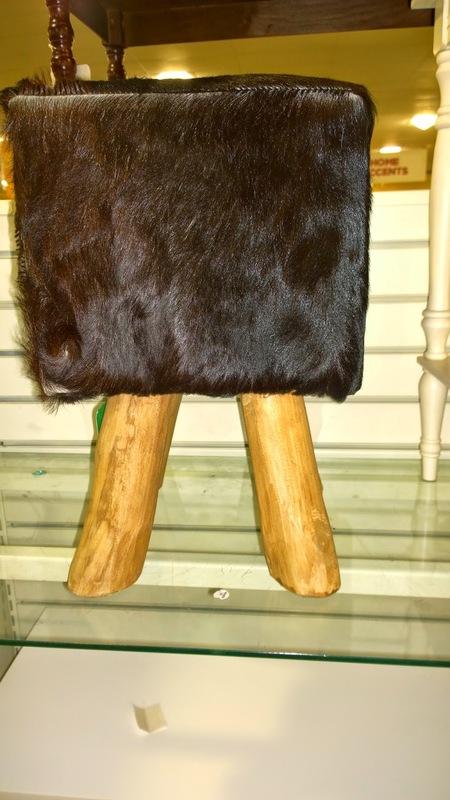 How's this fur a foot stool? Hardy har har. With it's square body and wooden legs it looks like it used to be alive! 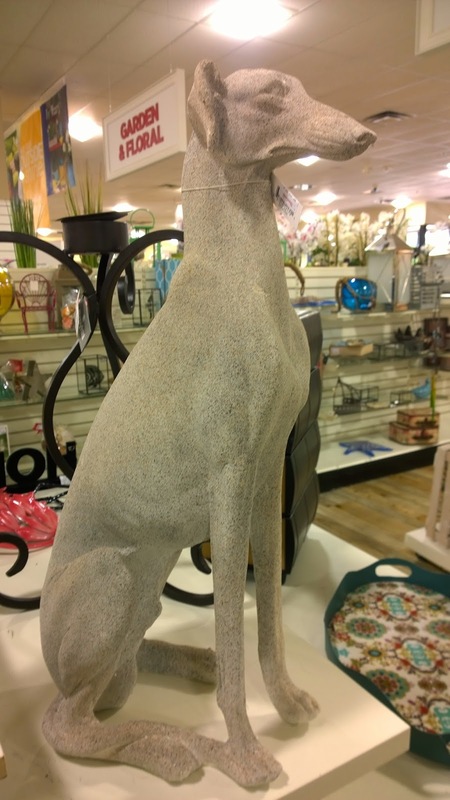 Great Danes or other types of dogs are very popular right now in the ceramic animal world. Pick one up today so you can be like all the cool kids. Don't you want him to greet you on the way in each day? 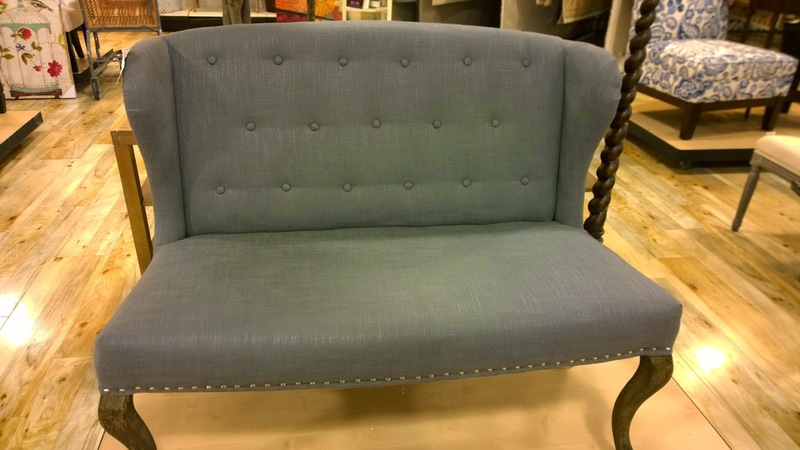 This gray settee would look very cute in an entry way or in the bedroom. It's tufted back and formal air could go with many styles of decor. 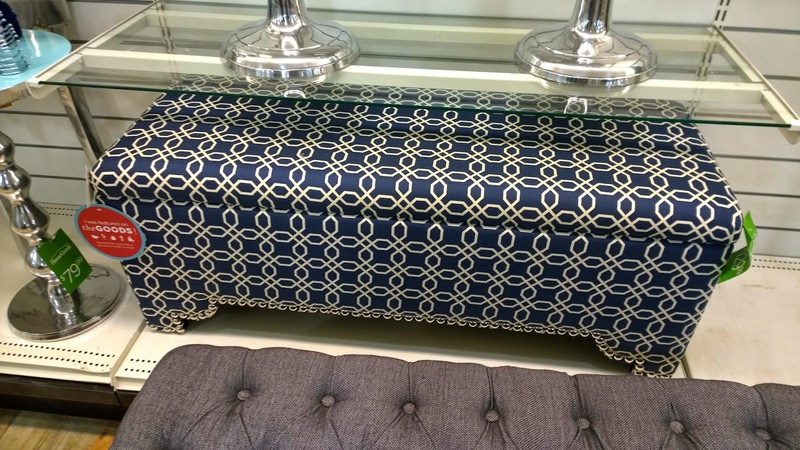 This Navy and white storage bench would be great at the end of a bed or even outside on a patio. 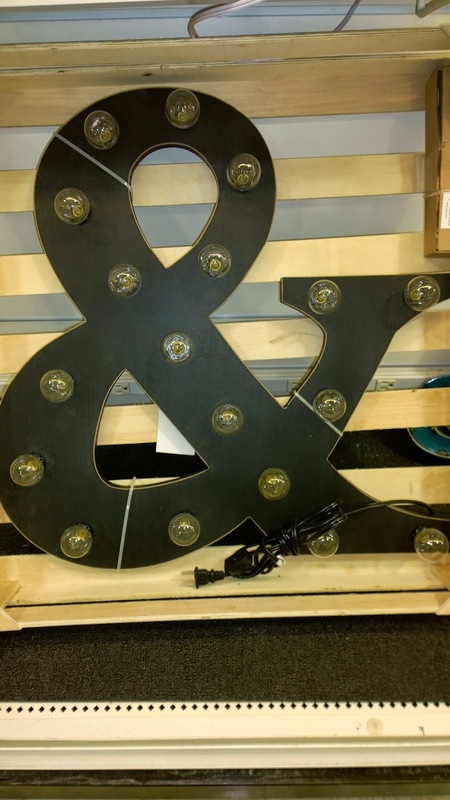 How cute is this huge metal ampersand all lit up with retro round glass bulbs? 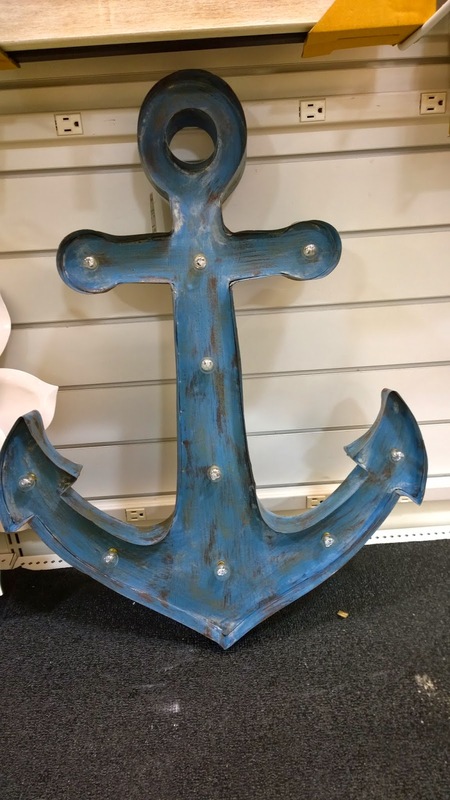 This metal anchor with bulbs would be very cute on a patio or even in a little boy's nautical themed room. 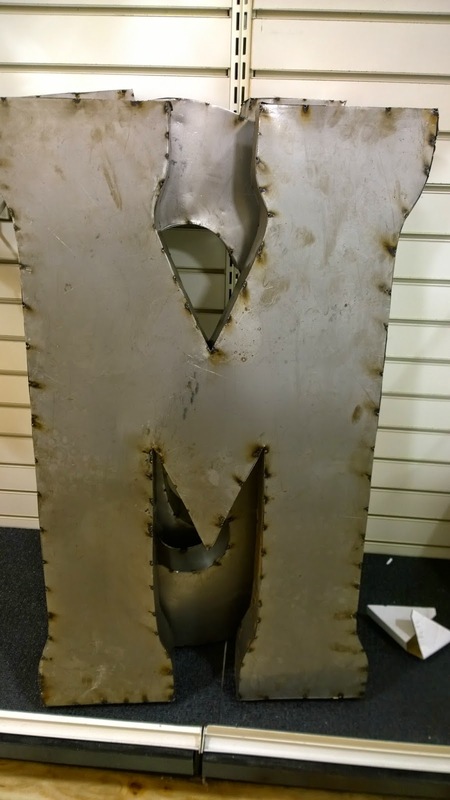 A Huge metal "M" -couldn't help but think of my son. 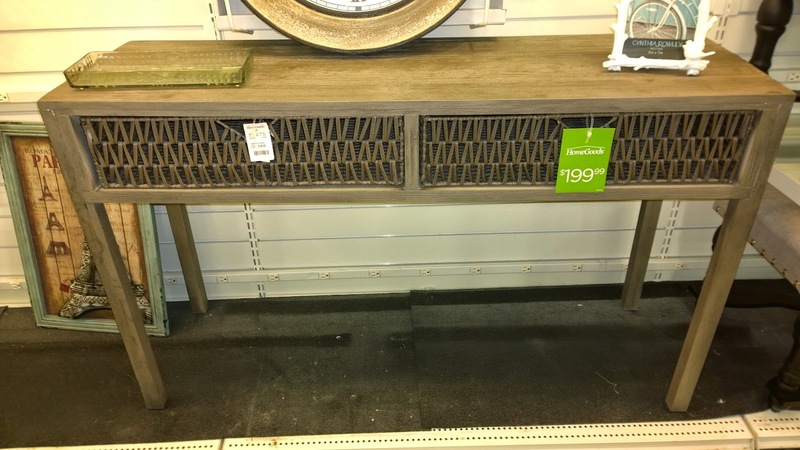 This entry table was very cute in it's light grayish toned wood. 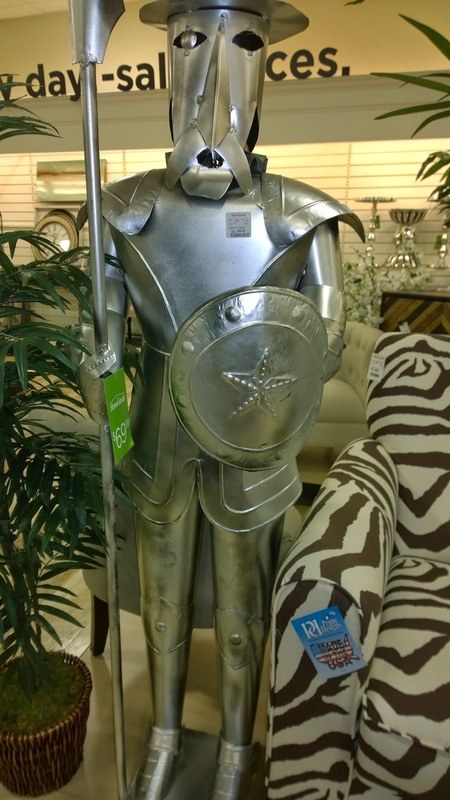 And who doesn't want a huge metal suit of armor awaiting them at their front door? Maybe if you live in a castle you need this. In the dish aisle they had very pretty food display stands. 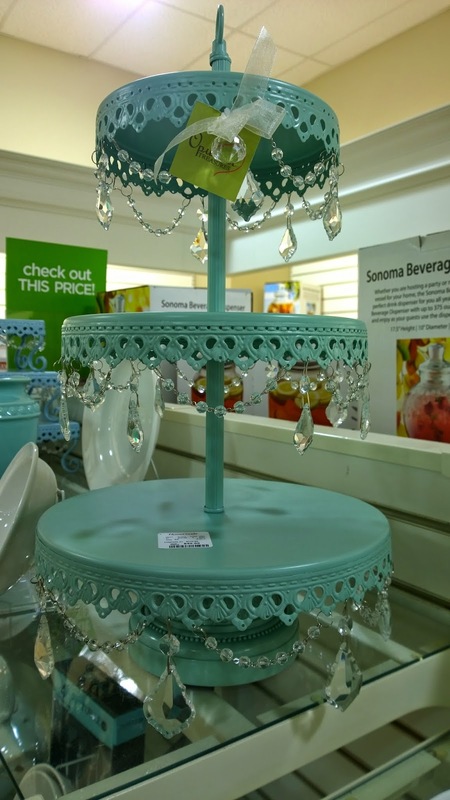 This turquoise one with crystal drops would be very pretty for a wedding or baby shower or even a little girl's tea party. 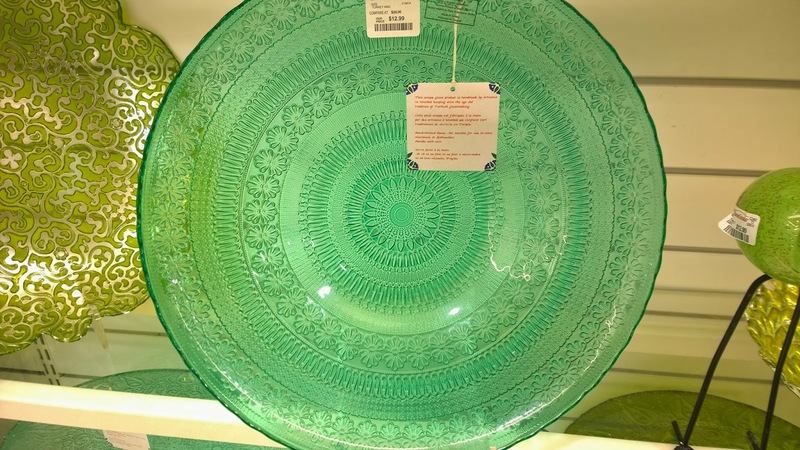 They had very beautiful green glass trays that would be very pretty on a white linen table cloth. 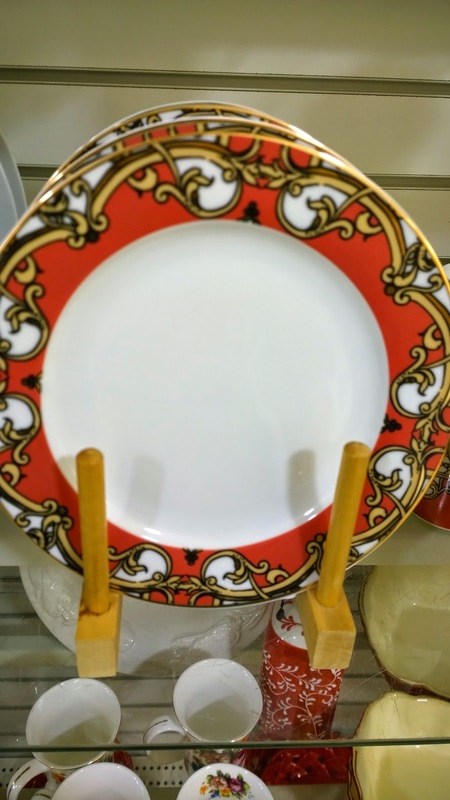 If you're like me and love using your expensive china for everyday eating, then picking some up on sale or clearance is the way to go. 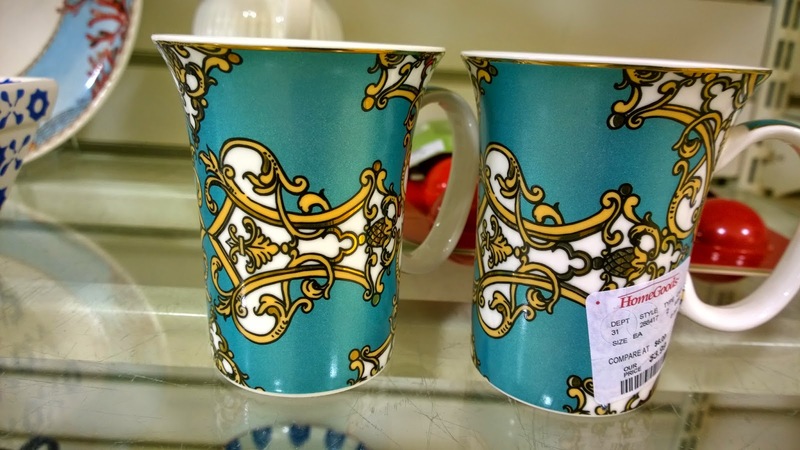 You're not too concerned with it breaking or being sad if it's your grandmother's china. 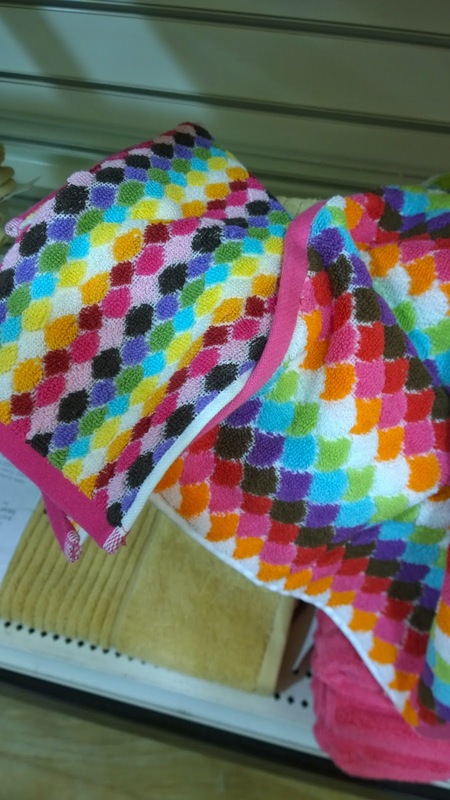 I'm not usually a fan of these colors, but these fun towels would look very cute in a little girl's bathroom with white painted walls. Who doesn't need a huge gray and white storage bin? For summer you could throw your deck or pool towels in this and call it a day. 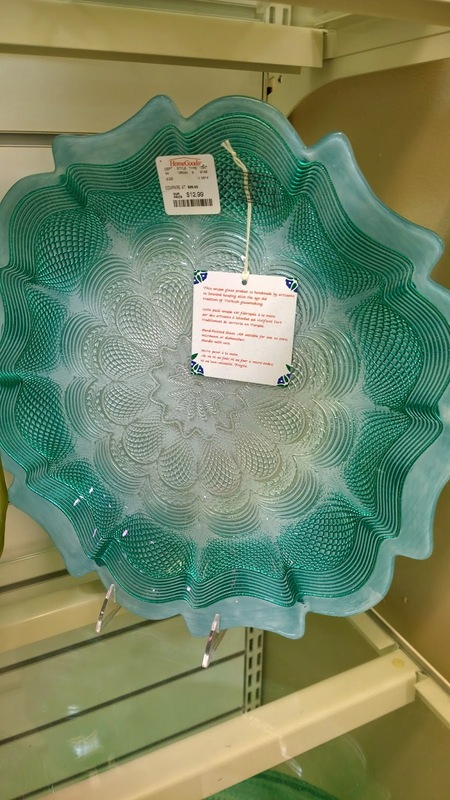 This pretty capiz chevron print serving tray was in the clearance rack. 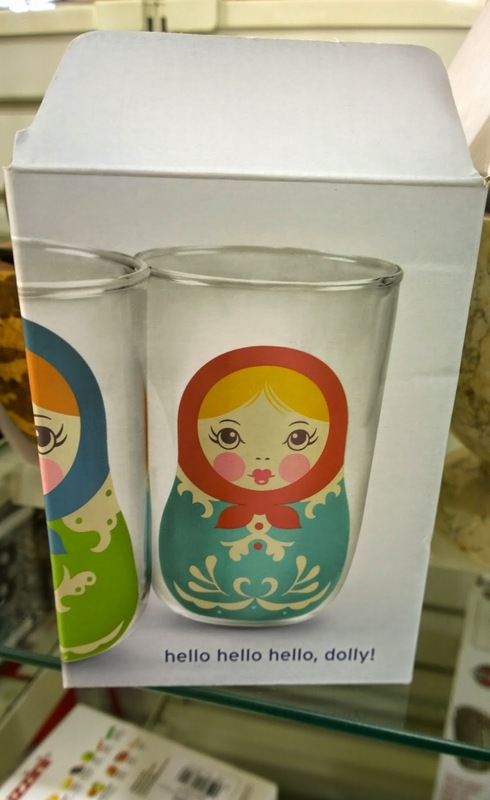 Hello Russian stacking doll glasses! These are so cute and they had two in the clearance aisle. Although I managed to leave the store empty handed, it's always fun to look around and get inspiration especially if you're not sure which direction you're headed in your decorating style.